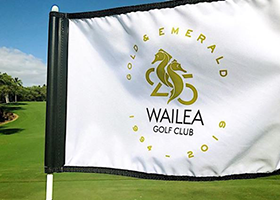 The former home course of the Champions Skins Game, the Wailea Gold Course is the most challenging of Wailea's trio. Designed by Robert Trent Jones, Jr., it has been ranked among the country's best new courses by Golf Magazine and Golf Digest, and one of the world's best designed by the readers of Conde Nast Traveler. Jones flavored the Gold with elements of classic golf course design, then finished it with a rugged, natural look. Throughout the course are stark lava rock outcroppings, indigenous Hawaiian grasses, an abundance of kiawe (a relative of mesquite), and remnants of papohaku, prehistoric lava rock walls built by early Hawaiians and preserved for their historic value. The Gold's 200 foot elevation change from top to bottom enhances the numerous ocean and mountain vistas available from virtually every hole. The course has been labeled a "thinking player's" course because it demands strategy and careful club selection to be played well.